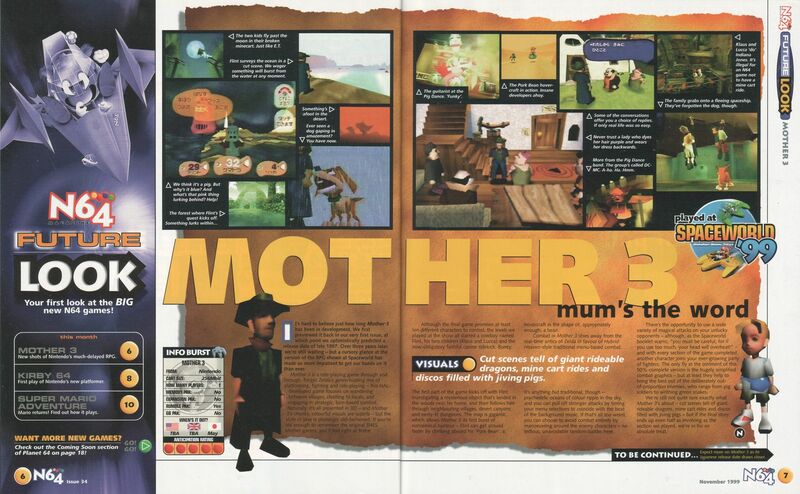 Here are 12 scans from N64 Magazine, which was a UK mag from the late 90s/early 00s. 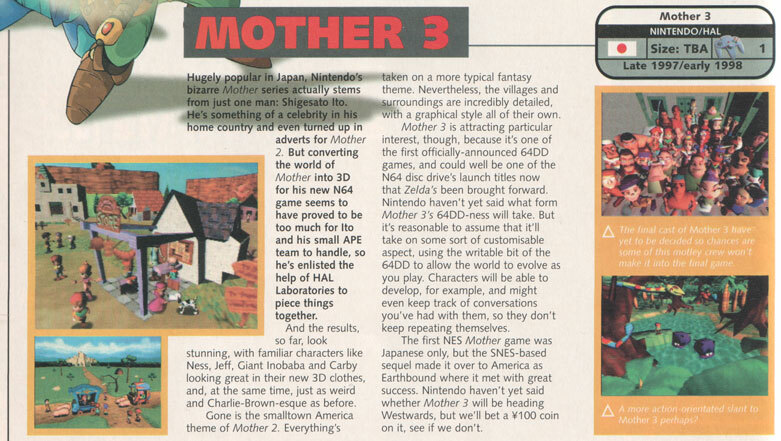 They’re all previews and gossip for Mother 3, naturally, except for a scan of a competition where readers had to send in US-related items to win an N64. Note the Mach Pizza air freshener! 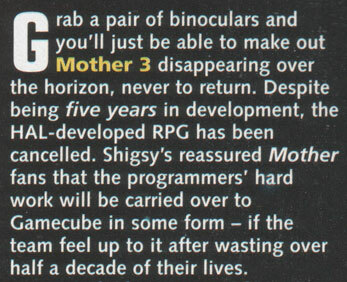 Some of the details are interesting, though the one about EB64’s cancellation is a bit wrong – Itoi never promised that the work would be used for GameCube stuff. I also don’t know why they say Ness and Jeff were going to be in the game, and I definitely don’t know who these “Great Inobaba” and “Carby” characters are. They’re sure not familiar faces to me! 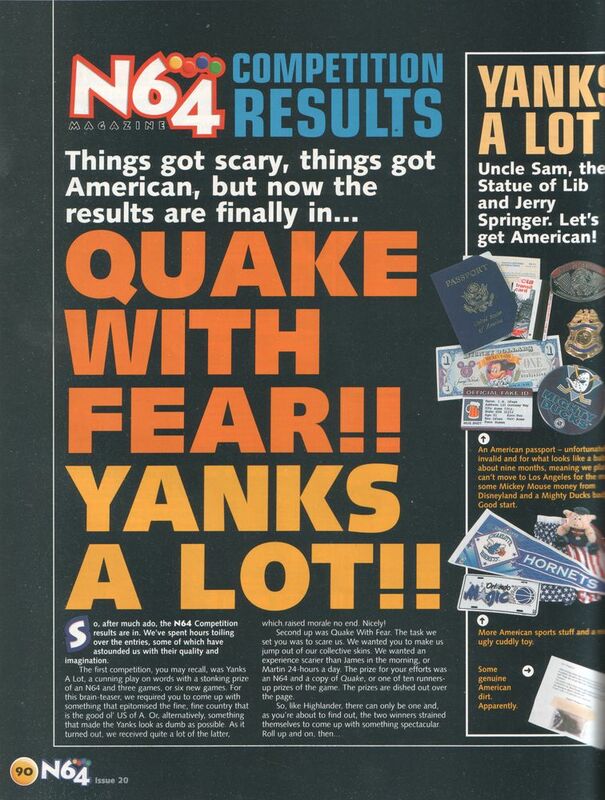 Still, it’s neat seeing what they had to say about the game over the years, it’s like seeing things from a different perspective. 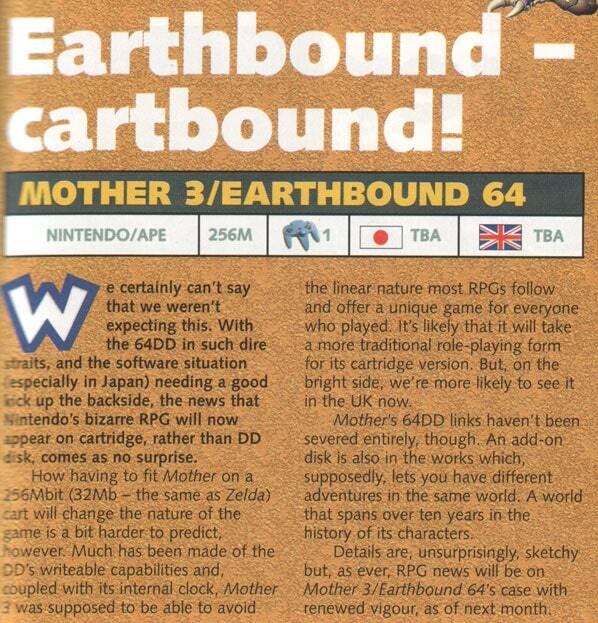 I wonder, if EarthBound 64 had been released in North America, how likely would a European release have been? hehe, they were making things up. trolling is a art, isn’t it? I’d say we’ve got 3-5 years until the demo or dev cart for EB64 surface somewhere, I wait for the day. …If they’re talking about sales, I don’t think EB was a “great success”. 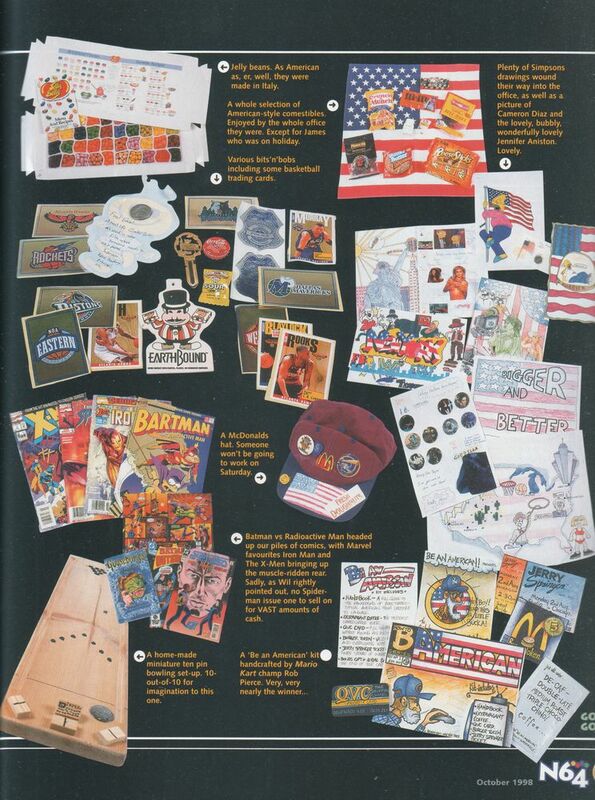 They could be talking about the devoted fanbase, but around the time this mag was published I don’t even think the EB community was that big… but what do I know, I was born in ’95. May be other mistakes but I’m too tired to read through the rest right now. 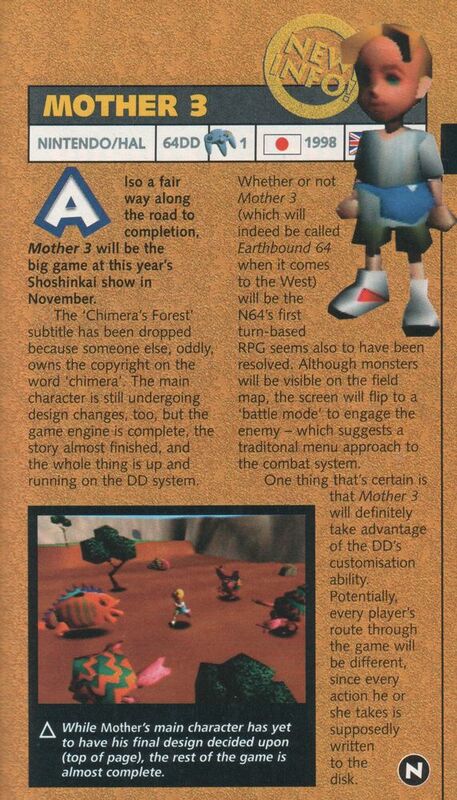 It’s nice that we can still get some interesting information on EB 64, considering it was cancled about 10 years ago. I’m suprised an EB 64 prototype hasn’t surfaced yet. Maybe this just means NCL is more protective of it’s protos. God, I can’t wait for the day when the M3 64 proto gets spread out to the internet. you know how cryptic and goofy that thing’s going to be. I just hope it happens in my lifetime. I agree with what you said. I hope something neat happens that’s EB related when I’m alive to. Man, sometimes I think I was born to late. As soemone who’s read and looked at everything about EarthBound 64 that she’s been able to find, I say that the EarthBound 64 articles in this post are definitely fake ones, either made by trolls or bored, drunken fans. They repeatedly misspell names (Shigesato Ito? Salso? ), make character names up (Great Inobaba and Carby), and seem to have a fixation on Dr. Andonuts’ fondness of donuts. 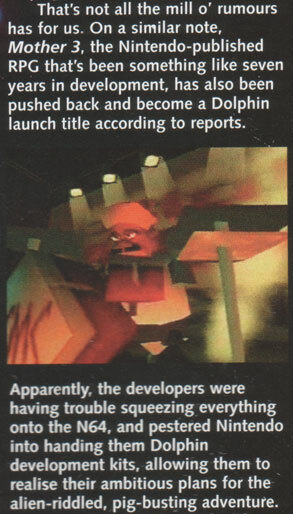 Also, all the screenshots they use can be easily found on Starmen or from the game’s preview video, and the articles provide absolutely no previously unknown, credible information about the game. 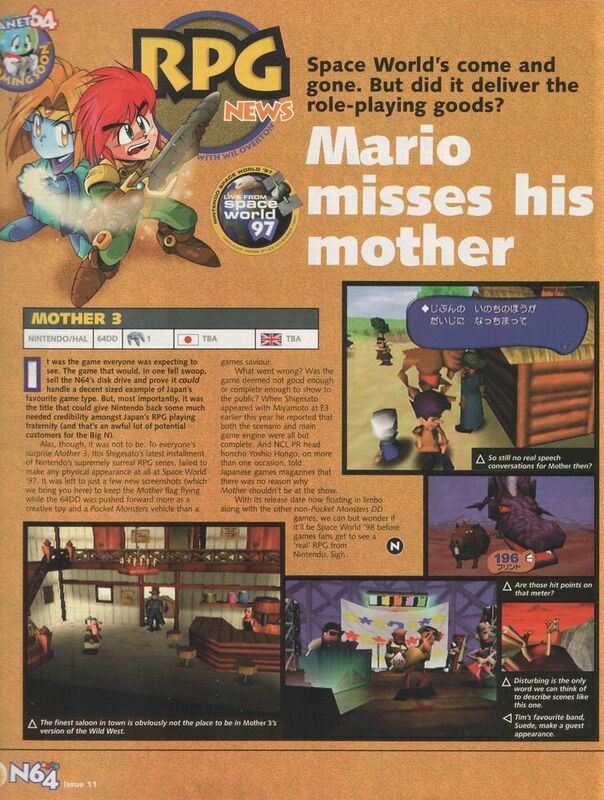 I hope that someone gets ahold of at least the EB64 demo (if not a development cartridge) sometime within my lifetime and releases it online, or at the very least we learn a lot of previously-unknown information about the game with more screenshots, music, and even videos. I’m always hoping for that day. Pippo here 🙂 The articles are definitely real, I can take photographs of the magazines I scanned them from if need be. 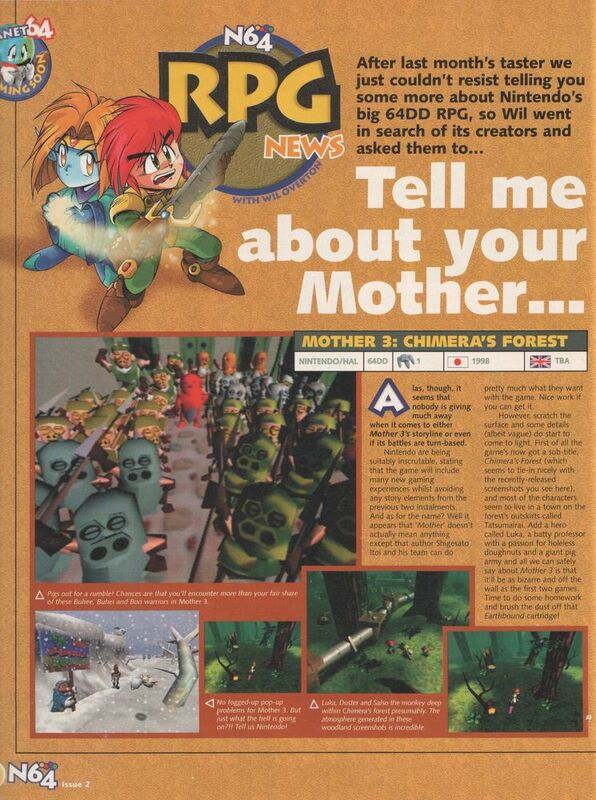 Console RPGs back then weren’t as prevalent or popular in the UK back then as they are now, so maybe the article writers didn’t give enough priority to fact-checking as they should have. Thought they would be of interest anyway, despite the errors. I think the facts are off because they didn’t have enough information to write about and they needed to make a presentable article that would captivate the readers. In the later articles, they make appropriate changes (namely, Ito to Itoi). 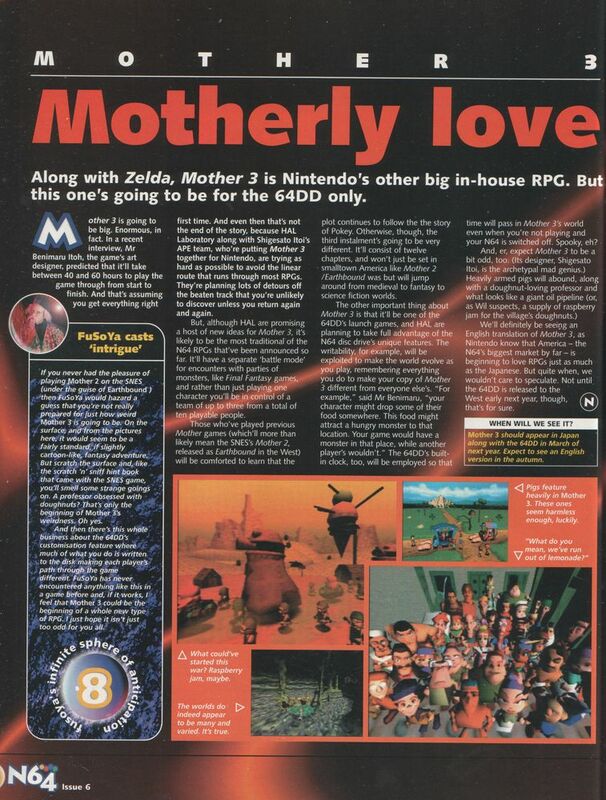 I think they feared that the 64DD was going to fail and they wanted as much info for the readers to be interested by the new attachment and the impressive launch games with that. Hopefully the demo or development cart gets out, that would be amazing to view. Thanks for the scans, Pippo! 8BitWalugi: actually, it’s kind of depressing watching the tone go from “this is coming out and it looks great” to “this is officially canceled”. Also, People say that the Ness seen in earlier screenshots was a beta design for Lucas, but in the pic of everyone by the sidewalk cafe you see Lucas AND the Ness-lookalike. Hm..